Examination of diachronic trends in prehistoric domestic structure size and organization have revealed that the most prominent changes occurred between the PPNA and the PPNB. No major changes are well documented prior to this period (except for the site-specific exception of the Early Natufian at 'AinMallaha). Thus, the fundamental questions are: What was the nature of social organization that characterized pre-PPNB settlements? What do the changes from the PPNA to PPNB imply in terms of social organization. Does household size increase? Does it reflect a change from loose extended families with buildings inhabited by individuals to nuclear families residing in single buildings as Flannery (1972) hypothesized? Does it represent a shift from nuclear family residences to extended family residences? Are both periods characterized primarily by nuclear family or multifamily residences, or are other interpretations more plausible? The size of the residential unit is one aspect of household reconstruction that has been the subject of considerable discussion. Cross-cultural studies of modern communities have asserted a correlation between the total floor area of dwellings and settlement population, although mean values vary considerably (e.g., Casselberry 1974; Cook and Heizer 1968; Kolb 1985;Naroll 1962;LeBlanc 1971).The most prominent study is that of Naroll (1962), who argued that a mean of 10 m2 per individual could be effectively used to estimate prehistoric populations. Naroll's(1962) results in particular have been widely used by archaeologists (e.g., Flannery 1972) to estimate the number of individuals residing in a structure. Ethnoarchaeological studies of agricultural villages in southwest Asia provided further insight into the correlation between floor area and household size (Horne 1994;Kramer 1982; Watson 1978). Kramer's research at Shahabad, Iran, indicated that residential floor area values per individual, when those under the age of two were excluded, were consistent with Naroll and LeBlanc's findings (Kramer 1979:155). In contrast, the average dwelling area was 7.3 m2 per person at Hasanabad, Iran (Watson 1978:137),lower than many cross-cultural findings (yet see Kolb 1985). These studies have found that variation in household size, rather than wealth, was positively correlated with the amount of roofed dwelling space (Kramer 1979:154-155;Watson 1978:133137). This is, however, a subject of which there is some disagreement (e.g., Wilk 1983:111).One complicating factor revealed in studies of modern southwest Asian villages is deciding what portions of the habitation area to include in the calculation of floor area (see Jacobs 1979). The values given for Shahabad and Hasanabad in Iran only include the roofed living area, not associated storage facilities, stables, and enclosed formal courtyards. When portions of the latter are considered, then obviously these values would increase. If Naroll's (1962) average floor area estimate is applied to the sites in this study, the number of individuals exceeds two per domestic structure only during the Early Natufian of 'Ain Mallaha and then much later in the PPNB. This suggests that nuclear families were only present in these contexts, as argued by Flannery (1972). If so, then we are required to explain why dwellings inhabited by nuclear families appeared in the Early Natufian at one site, were absent elsewhere, and disappeared from the Middle Natufian onward at 'Ain Mallaha until they reappeared in the PPNB. At PPNB Beidha, the primary aspect of the increase in building size during phase C was the addition of a basement with small storage and work rooms. If one contrasts the estimated size for phase C upper stories with that of the residential space for the previous phases, there is only a more modest increase to 16.9 m2 of floor area (Table 1). Applying Naroll's (1962) floor area estimate for these Beidha phase C upper stories, there are still fewer than two people inhabiting each phase C building, too low to represent a nuclear family. Thus, following Naroll's formula, houses large enough for nuclear family residences occur primarily only during the PPNB and only at some sites (Table 1). Prior to that, structures were not large enough to contain complete households. Although these ethnographic and ethnoarchaeological studies of modern communities are useful in revealing links between the floor area of dwellings and household size, one should be cautious in trying to directly apply these results to the interpretation of prehistoric sites (Kolb 1985). Other factors, such as community views on crowding, economic basis, residential patterns, degree of nucleation, and overall population size, can have significant effects on the mean amount of floor area per person (Casselberry 1974; Dohm 1990). The prehistoric sites in this southern Levantine study have quite different village layout and organization, lacking the large dwell ing compounds with formal internal courtyards and multiple residential rooms within them that typify modern Iranian villages. Nor are there compelling reasons to expect that prehistoric household organization was analogous to modern Iranian villages, which are characterized by extended or joint families with typically more than one nuclear family residing within a compound. 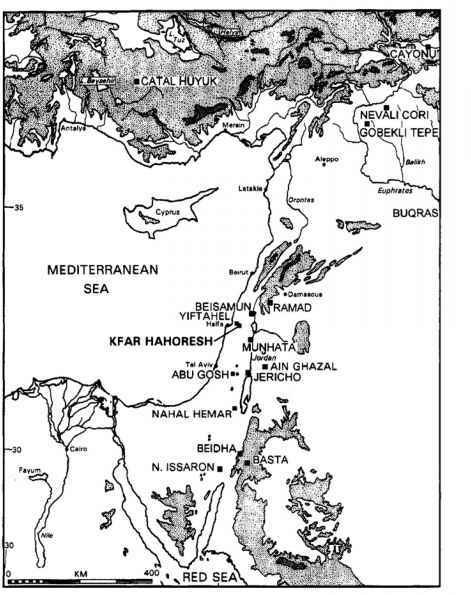 For example, modern Levantine villages, which have been subjected to less ethnoarchaeological study, often lack the courtyard or compound organization ofIranian villages (Antoun 1972; Aurenche and Desfarges 1982, 1985;Khammash 1986). Moreover, inheritance may have been different than in modern Iran and in historic Mesopotamia where compound rooms, including their associated storage units and stables, often become partitioned over time, and one family may own rooms ofvarying functions in different parts ofthe village (e.g., Horne 1994; Yoffee 1988). Given this situation, it is worthwhile to consider whether the summary value stated by Naroll (1962) may be too high for this prehistoric context. Kolb (1985) and Wiesner (1982) have pointed out that Naroll s relationship was nonlinear and that there was a wide standard deviation. Ten of the eighteen ethnographic societies reported by Naroll(1962: Table 1) have mean floor areas of less than 7 m2 per individual, and some values are considerably less. Kolb (1985:594) noted that the distribution was essentially bimodal and skewed due to a few examples with large means. Naroll(1962) also used the largest settlement within a society and incorporated many nonliving areas, such as wall bases, patios, courtyards, and alleys into his calculation. Watson (1978, 1979:296-297) noted that prehistoric Neolithic room and building size (in southwest Asia and elsewhere) were typically considerably smaller than in ethnographic settings such as Hasanabad. She suggested that this may not indicate a smaller number of individuals per room or buildings, but rather the amount of floor area per individual within living quarters was less than today. Given that early prehistoric settlements in the southern Levant were part of the transition from a long-enduring, relatively mobile hunting and gathering lifestyle to a radically new sedentary food producing economy, some persistence of earlier organizational traditions would not be surprising. Therefore, ethnoarchaeological results in hunter-gatherer use of space should be considered as well (e.g., Yellen 1977; Whitelaw 1991; Wiesner 1982). Cook and Heizer's (1968) analysis of ethnographic California hunter-gatherers provides further support for nuclear families' use of much smaller structures. Of the thirty California Native American groups reviewed, none had mean floor areas approaching 10 m2 per individual. Mean floor area per individual was always less than 8 m2, with a range from 1.26 to 7.7 m2 (Cook and Heizer 1968:Table 2). In addition, the !Kung of Africa, with nuclear households living in individual huts, had floor areas of 5.9 to 10.5 m2 per person depending on the size of the camp (Wiesner 1974; Yellen 1977). Based on these results and the previous observations, Naroll's values are considered too high for the prehistoric hunter-gatherer and founder agricultural settlements under consideration. I suggest that nuclear family households (most typically two adults and their offspring) best characterize domestic dwellings throughout this time frame in the southern Levant, from the Early Natufian through the PPNA and into the PPNB. Thus, no change in household size occurred during this period. This interpretation is supported by the correlation of ethnographic patterns in the size of houses and the floor area per individual of many hunters and gatherers and small agricultural communities and the prehistoric structures under consideration (Figure 2), along with several other lines of evidence. The latter include the widespread presence of hearths within prehistoric structures, the presence of other facilities such as bins and storage units within houses, and, where preservation and documentation permits, the presence of artifactson the floors of buildings indicative of a range of domestic activities. The interpretation that nuclear family households persisted from at least the Natufian through the PPNB differs considerably from Flannery's (1972) interpretation of individual structures prior to the PPNB being primarily inhabited by single individuals of polygamous households (see also Kuijt n.d.; Cauvin, Kuijt, Rollefson, all this volume). Community organizational patterns further support the nuclear family hypothesis. Structures at these southern Levantine sites were generally organized as clusters, often linear and along terraces. They were predominantly freestanding even when situated close together, with the only exceptions being sites in the Negev and Beidha phase A. Often, such as during the PPNA in the Jordan Valley, freestanding structures with considerable open space from one to the next predominate. Settlements were never organized similar to Flannery's(1972) ethnographic analog of pastoralist kraal-like compounds arranged around a large central space and contained by a wall or fence. These early settlements were less syntactically complex than kraal structures (Banning and Byrd 1989;Hillier et al. 1976).They were generally characterized by athree-syntax path represented by a single cell, which may have internal subdivisions, linked to an open space, and the two linked by a doorway. In contrast, a kraal compound is a six-syntax path where aggregates of closed cells are unified not by attachment but by inclusion. The structures prior to the PPNB and during the PPNB are not considered to comprise multiple, extended families. If these structures housed multiple families, then they should be considerably larger. For example, the mean interior area for the small sample of multifamily dwellings presented by Cook and Heizer (1968) and Casselberry (1974) is never less than 75 m2. Figure 2. 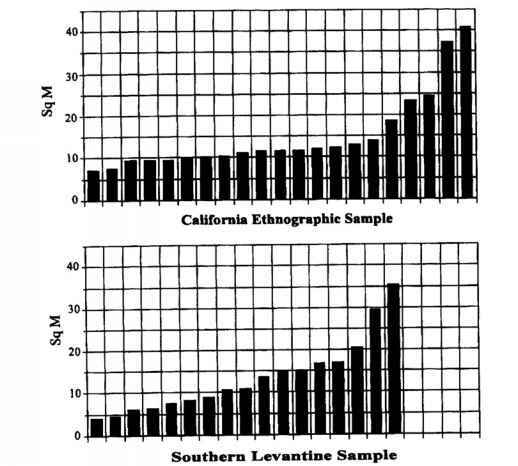 Distribution of mean interior areas of domestic structures for California ethnographic hunter- gatherersample (Cook and Heizer 1968:Table 2) and southern Levantine Epi-Paleolithic and Early Neolithic Sample (from Table 1). The buildings prior to the PPNB are rarely multiroom (which could be expected if individual families resided together), and the multiroom PPNB structures generally have a single large room with a hearth along with a corridor and very small storage or work rooms. These are also dissimilar to the modern Iranian village houses previously discussed. Nor are there other indicators of multiple families residing in a single structure, such as multiple hearths (hearths are never situated within the small PPNB rooms). The only possible exception to this pattern may be during the Early Natufian if the ramada-like structures at 'Ain Mallaha (and possibly Wadi Hammeh 27) housed multiple, perhaps extended, families. This latter possibility is based on the presence of multiple hearths within one structure, the lack of information regarding direct antecedents, and the small sample size for these Jordan Valley Natufian sites.